Political Activist Weighs In On Zimbabwe Violence NPR met with Savanna Madamombe, a political activist in Zimbabwe, last month. NPR's Audie Cornish spoke to Madamombe about whether she's still hopeful for a new Zimbabwe following the unrest. NPR met with Savanna Madamombe, a political activist in Zimbabwe, last month. NPR's Audie Cornish spoke to Madamombe about whether she's still hopeful for a new Zimbabwe following the unrest. 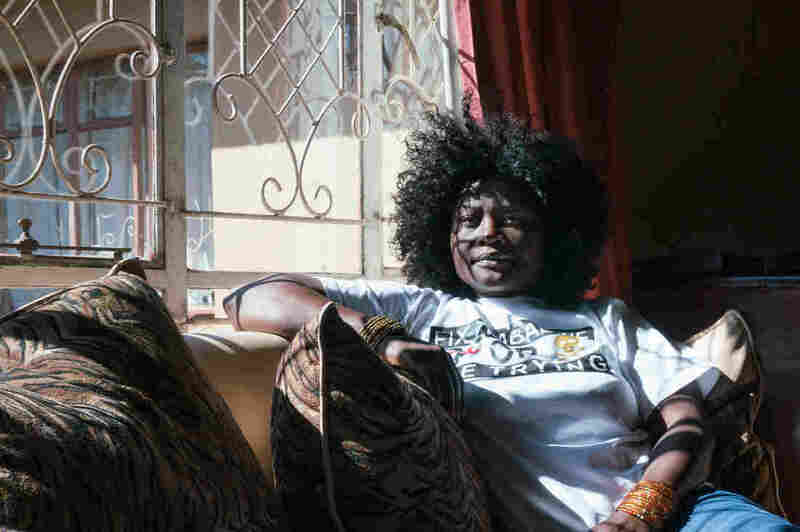 Savanna Madamombe, a political activist in Zimbabwe, at her family's home last month. Also in downtown Harare was activist Savanna Madamombe. Our co-host Ari Shapiro met her back in June when she was feeling a lot of hope for the country. Without Robert Mugabe, she said, there was a new sense of openness and freedom of expression. Here's what she told us then. SAVANNA MADAMOMBE: The Mugabe era is gone. And it's something that can't be ever allowed to come back. We've been allowed to speak. It's up to us now to grab it and say, look; every day we are being told it's peaceful, so let's create the peace. CORNISH: So when we spoke to her earlier today after she saw military trucks roll in and clamp down on demonstrators, she was shocked. MADAMOMBE: I feel like something has just been stolen from me. I felt, you know, just like a sick feeling. It was unbelievable. It's like reliving the Mugabe era again. CORNISH: Before this Savanna Madamombe had lived in the U.S. for nearly two decades. She'd only just come back to Zimbabwe last winter after the ousting of Mugabe. By June, she was committed to carrying out peaceful acts of protest in the city. When she spoke with ALL THINGS CONSIDERED, she was wearing a shirt that said fix Zimbabwe, or die trying. We followed her as she went to plant hundreds of flowers on the sidewalk of one of Harare's main streets. She said the flowers symbolized new life. And for the past few weeks, she's been working with residents to keep them alive. Today I asked her if she planned to keep doing that work. MADAMOMBE: It does cast a heavy shadow. And I'm scared. After today, I don't know. I can't even think that I want to go and continue to do what I was doing. I'm afraid. I can't even think that tomorrow I'll go. Definitely tomorrow I'm not going to go into the city. Will I find the flowers still there? I don't know because half of them were torn with the water tanks when they were sprayed by the water tanks. But the flowers are the least of my worries. People died today. I'm not even worried about the flowers anymore. So it really sets you in a whole different direction. And as far as the intent, the hope - it kills everything. CORNISH: Do you have any faith in the election that was just held? Do you feel that was a free and fair election? MADAMOMBE: Until yesterday I kept telling people that the process that I saw - I'm very confident the elections are free and fair because we had an atmosphere of freedom. Those who wanted to campaign were campaigning. Those of us who wanted to plant flowers were planting flowers. Those of us who wanted to have conversations were having conversations. I went to vote. And the process that I went through, I was very satisfied that whatever's coming out of that is free and fair just like every observer who came in here. And they had said until the day that we held our elections everything was credible. But now I just don't know where we're going. CORNISH: She said that for her, the responsibility falls on both parties to step up and call for peace. But she's worried because of what she saw today. MADAMOMBE: Those trucks - they remind me of the days with Robert Mugabe. They reminded me that if things change, nothing really changes. So if we continue to tell people that we are free and then we clamp down on them - it was unnecessary to use live ammunition on demonstrators. That's not what I expected. I expected the soldiers to come in. Even if the soldier had just come in, people would just stop without them doing anything. They - people would just stop. There was no chance to even negotiate. I didn't see any negotiating. I didn't see a president who said he's a president of the people and he will listen to the people. I wish and I hope this is the last time that we are witnessing something like this. CORNISH: That was activist Savanna Madamombe. We reached her at her home in the capital of Zimbabwe today.